Momma on a Mission: The Pieces Were Always There. 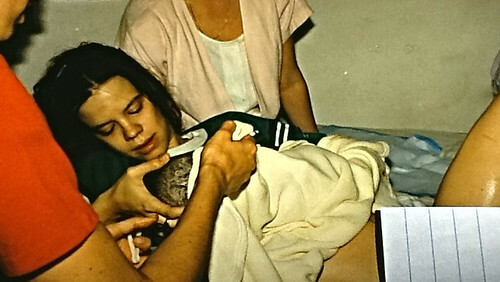 Twenty six years ago, I was born unassisted at home in a little second floor apartment in Largo, Florida. Yeah, my parents were a little crazy. My mom didn't even decide that she wanted to have me at home until labor had already started. One of my parents' paramedic friends dropped off an emergency childbirth kit, but he couldn't stay because he'd lose his job if he did and something went wrong. But of course, nothing went wrong. I was born just fine into my daddy's hands. They even took pictures, actual birth photos of me crowning and everything- but I'll spare you the graphic ones. Twenty two years ago, I was a four year old little girl who had just become a big sister. I came super close to being in the room when she was born, but I chickened out at the last minute and decided to spend my time in the waiting room, coloring and playing with my brand new Lite Brite- the one that I had picked out during a rushed pit stop at Toys-R-Us before we headed to the hospital. Yep- the same mom that chose to have an unassisted homebirth with me chose to birth my sister at the hospital- and said afterwards that she much preferred the homebirth. Go figure. After my sister came home, I loved to pretend I was a little mommy. I even nursed my baby dolls. Eighteen years ago, I was an eight year old little girl that was totally fascinated with pregnancy, birth, breastfeeding, and infant care. I'd spend hours reading the books that my mother had collected during her pregnancy with my sister. There was While Waiting, with the fascinating diagrams in the front showing the position of the baby and the growth of the uterus through the months of pregnancy. Then there was the baby book that shall remain unnamed- because it was used so much that it broke into 4 different pieces and the cover went missing. I learned how to bathe a newborn, breastfeeding basics, how to sterilize bottles, and basic developmental milestones. Five years ago, I was newly pregnant with my first and starting to look into birth options. Little did I know the world that I would soon become completely immersed in. I thought I was just researching my options for my upcoming birth, but what I was really doing was uncovering a passion. I soaked up as much information as I could, and I continue to do that until this day. Three years ago, I was on a family vacation in Oregon and pregnant with my second, when I had a divine dream. I was trying to survive my way through life, knowing that my husband was called to ministry within the church, and thinking that that's what I was supposed to do as well. As much as I loved birth, I didn't think that birth work could be a calling- and didn't I want to serve God with my life? (ha!) Then as we were on this trip, I had a dream that I believe was truly from God. I was helping a friend of mine through labor. I was praying over her, supporting her, encouraging her. I was the only one there that knew how to help her, and I confidently stepped in like I knew exactly what I was doing(and I did!). I was still just barely starting to figure out who I was at that point in my life, so to have a dream where I was so totally confident and comfortable in who I was and what I was doing was incredibly inspiring. The revelation that birth work could be a calling, a gifting, a ministry? Wow. From that moment on I began to explore the idea that maybe this was what I was supposed to do. All the pieces had been there, I just needed to put them together. Two and a half years ago, I gave birth to my son in my own bed, in my own home, with the late afternoon sunlight streaming through the three huge windows in my bedroom. That experience changed me forever. It was the start of something amazing. It empowered me, and I knew I had to help other women have a chance at that same experience. Eleven and a half months ago, I decided to stop just waiting around until circumstances allowed me to start doing birth work, and actually DO something with the time while I was waiting. I saved up for a couple of months, and then enrolled in the Childbirth International birth doula course. I started scouring Half Price Books and the library bookstore for childbirth and breastfeeding books, and built a pretty decent start to a lending library. Seven months ago, I had the incredible honor of attending Jessica The Leaky B@@b's homebirth of her precious Arden. Oh wow. If there was any doubt how I felt about birth, about feeling called to this, about absolutely loving birth and everything to do with it, that was all wiped away in one night. It was incredible, simply incredible. Two months ago, I offered to chat with a mom who was expecting for the first time, just mom-to-mom from someone with a little experience to someone doing this for the first time. I answered questions, validated concerns, and let her borrow some of my books. A couple of weeks later she called back and asked me if I wanted to be her doula. Did I?!?! Of course!!! Just two days ago, the expectant momma and her husband sat in my living room for my first prenatal visit ever, and we talked about birth plans and options and what she wanted. Then she paid me. Two days ago, I made actual money doing this. It wasn't a lot, and it's a super small start, but it's still a milestone for me. For the first time, I've made money doing what I've dreamed about doing for so long. And next month, I'll have the incredible honor of being with this family as they welcome a brand new human being into their family. I can't imagine loving any job more. Awesome and inspiring! I'm a newbie doula too, with my first clients due in February. I love hearing all the passion and destiny behind other doula's callings to this field. :) Thank you for sharing! Thank you! Good luck with the births- your mommas are blessed to have you there supporting them! congrats on getting paid ;) (and what that represents) that's awesome!